Chicken Harra is the combination of chicken pieces with some green, yellow bell peppers to give a greenery (harra) taste of the dish. 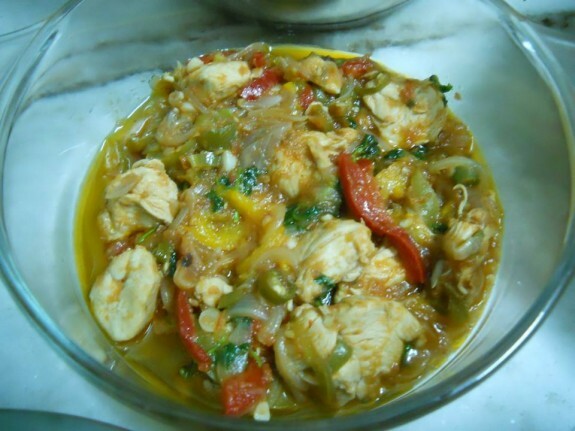 Get the delicious chicken Harra Recipe from here. 1. Season the Chicken pieces with salt and pinch of turmeric and set aside. 2. Heat oil in a pan and cook the onions until light brown in colour. Add garlic chopped and cook until the raw smell comes out. Then add the ginger paste and cook again for few minutes. 3. Add the chicken pieces and cooked until light brown. 4. Now add all the bell peppers and chili peppers into the pan and cook for another 5-6 mins. 5. Sprinkle some lemon juice (2-3 tsp) and little salt over the mixture. Add water and ground red pepper. Cook until the chicken will be tender or about to 30 mins. Add chopped cilantro and mix well. 6. Your hot Chicken Harra is ready to serve.